Racing fans, start your engines. SPEEDGEAR is the leading provider of open wheel racing merchandise in the USA and the only site you need for all of your Formula 1, NASCAR and Indy racing league collectibles, die-cast models and authentic racewear insignia clothing. 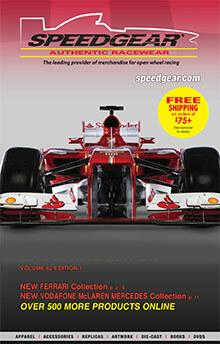 Series, Drivers, Team & Brand - SPEEDGEAR is a racing fan's one-stop Indy Car series, Formula 1, and NASCAR shop. Shop by series, driver, team or by brand to find all of the collector's items on your wish list. You'll find items from an A to Z list of the top teams, drivers and brands in the industry including Ferrari, Jaguar, BMW, Honda, Ford, Red Bull Racing, Renault F1, Champ Car, Penske, Williams F1, Sauber F1, Newman Haas Lanigan, No Fear, and more. Honor all of your most celebrated drivers of yesterday and today including Michael Shumacher, Ayrton Senna, Mario Andretti, Dale Earnhardt, Valentino Rossi, Mark Webber, Paul Tracy, Danica Patrick, Helio Castroneves , and dozens of others. Apparel & Accessories - Whether you're a Ferrari fanatic, all about BMWs or a Lamborghini lover through and through, you'll find a winning selection of apparel and accessories that will be sure to thrill and rev up any racing enthusiast. Browse an extensive selection of logo merchandise including crew shirts, polos, tees and sweatshirts, jackets, shorts, robes, hats and driving gloves, as well as women's and kid's branded apparel for the entire family. Find the perfect wearable accessory with branded belts and bags, sunglasses, watches and wallets, plus cell phone cases, automotive accents, and functional accessories and decor for the home or office. Entertainment & Collectibles - Deck out your monster garage or man cave with race worthy posters, lithographs and artwork, fill your library with a collection of racing books from the Formula 1 shop, or watch your favorite drivers cross the finish line over and over again with a wide selection of DVD's that salute all of your favorite heroes behind the wheel. Discover the Sounds of Racing with NASCAR shop CD's, have some fun with R/C and slot cars, gaming accessories and go karts, or find the perfect keepsake with 1:2 scale helmets, flags, patches, key chains, calendars, clocks, figurines, and more priceless collectibles. Die-Cast - Die-cast car collectors will love SPEEDGEAR's extensive collection of Formula 1 racing, Indy Car Series, GT Race Car die-cast models, and more! Celebrate all of your favorite cars and racing champions with model kits, die-cast motorcycles, old school classics, street cars and movie themed models, available in your preferred scale. Don't forget to pick up the perfect display case to show off your entire prized die-cast collection. For over 23 years, SPEEDGEAR has been proud to serve as the ultimate source for quality racing apparel and accessories. From rare collectible Indy 500 die-cast cars to calendars, books, shirts and caps that salute your favorite cars and drivers, SpeedGear has everything for the racing fan, and then some.